The video installation titled Aerocene by Tomás Saraceno fits into the multidisciplinary long-term project known as Aerocene, which represents a new era. As a synthesis between art, technology and environmental awareness, Aerocene embodies a vision of fossil fuel- and emission-free travel and living in the atmosphere. Saraceno is hereby exploring the scientific and artistic aspects of our environmental problems. 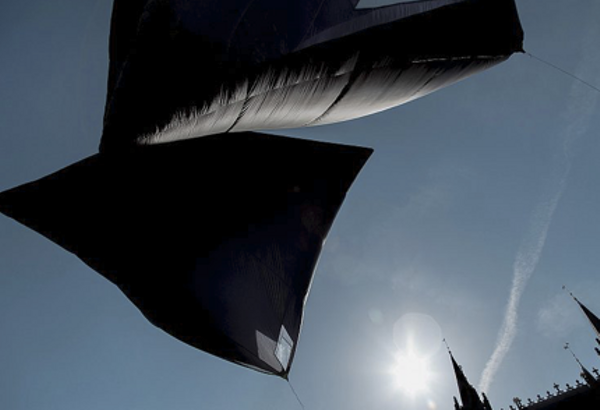 His performance last spring in the city centre of Bruges took the form of balloon-like sculptures floating in the air. They were propelled by the heat of the sun, which gives rise to a temperature difference between the inner and outer skin. As a result, the sculptures can move about without producing any emissions. With this constellation, Aerocene activates the public space in Bruges. The event was filmed in full and will be shown at the Poortersloge during the Triennial.